If your business is getting a bit thin why not try advertising your personal details and company logo upon our Customised Golf Wooden Pencils from our Golf Department here at Calendar Lady promotions. Our Customised Golf Wooden Pencils are a Handy size, half length golfer`s pencil printed up with your business details and company logo. Then just hand them out and stay advertised. To find out more about our Customised Golf Wooden Pencils click here and fill in the contact form and we'll get straight back to you. 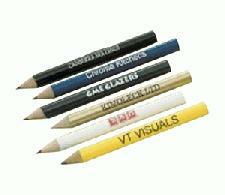 Other promotional and personalised items besides our Customised Golf Wooden Pencils click here.